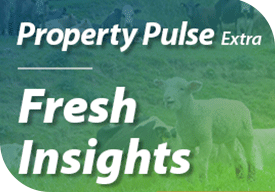 Encouraging signs for spring rural property market, particularly in sheep and beef sector. Several indications point towards a bumper spring in rural real estate, particularly around sheep and beef farms. PGG Wrightson Real Estate General Manager, Peter Newbold said the signs for a positive spring selling season in the rural property sector are evident. “Meat companies paying $8 per kilogram for lambs, the beef schedule holding firm, the weakening currency suggesting returns could stay positive for a while longer, and interest rates remaining at all-time lows are all positive trends for farmers, particularly those in the sheep and beef sector,” he said. Activity in the sector’s winter property market has been buoyant, says Waikato Real Estate Manager for PGG Wrightson Real Estate, John Sisley. “This winter, the quantity of transactions has equalled and, in some cases, exceeded sales for the same period last year. General optimism in the sheep and beef sector indicates a busy spring, with inquiry during the winter, especially from potential vendors, above normal. Cyclical issues around farm ownership and career progression are the main factors motivating those who seek to sell, particularly as older farmers consider increasingly complex compliance issues,” he said. Further south, Balclutha-based PGG Wrightson Real Estate Rural Sales Consultant, Stewart Rutter sees a similar trend. “We have noted that South Otago farmers looking to sell breeding and finishing properties made decisions earlier this winter than would generally be the case. That comes down to the good commodity prices and the age of the vendors. “Generational change sits in the back of most farmers’ minds. Approaching the end of their careers, they know they need to time that decision wisely. With interest rates remaining favourable, older farmers will see that now is an excellent time to sell and pass their farm onto the next generation, giving a new owner the chance to make a positive start on it,” he said. Several Hawke’s Bay pastoral farms sold in June at values approaching $12,000 per hectare. As Hastings-based PGG Wrightson Real Estate Rural Sales Consultant, Doug Smith explains, older farmers in the region are also choosing the right moment to end farming careers. “With income for sheep and beef well above last year’s figures, farmer confidence is growing. Several Hawke’s Bay farmers in their 60s and 70s recognise that this is a good time to sell. This includes some who have held back pending the fate of the Ruataniwha irrigation scheme, which now looks unlikely to proceed. These are generally properties of good quality, which, when they come to the spring market, should attract plenty of inquiry,” he said. Peter Crean, Canterbury/West Coast Real Estate Manager, said plenty of potential purchasers of sheep and beef properties are evident in Canterbury ahead of the spring. “We are particularly hearing from those looking to augment their farms with the addition of 40 to 70 hectare grazing blocks. With relatively few properties listed in this category, those that have been offered to the market have attracted plenty of interest. With plenty of demand, values for the region’s sheep and beef farms are likely to hold steady through the next few months,” he said. Southland Real Estate Manager, Andrew Patterson is seeing similar trends in his region. “This season is promising to be the most profitable for sheep and beef farmers for many years, with deer farmers also enjoying record schedules and lamb, in particular, set to put money in their pockets. Any of that not used to repay debt should motivate several to buy land. Even if Southland sheep and beef farms remain firm on current levels, with returns where they are, those property prices represent good value, which suggests the market will be active this spring,” he said. Notable recent sheep and beef farm sales include a 1,026 hectare finishing property at Mahoenui sold in June to a purchaser local to the King Country; and Ayrburn Farm, a wellestablished and well-developed 185 hectare irrigated Rotherham, North Canterbury property, which sold in late April. Both changed hands consistent with other recent sales in their respective localities.